Got a bit of a surprise over the weekend. I've received a few E-mails from the Wilson Bridge public affairs team E-mailed me regarding my complaint about debris on the Route 1 ATL and the clogged drains near the start of the bridge. First off, right after I sent my original E-mail, a team was dispatched to clear the drains of the debris I had noted. This has been done, though the rest of the sand/dirt along the trail has yet to be cleared up (another E-mail to VDOT/WWB is being sent this morning). As for the drains themselves, the Wilson Bridge team has known of their tendency to clog for some time. The drain grates that were installed (with the narrow slots) are apparently the ones that meet Federal design standards. 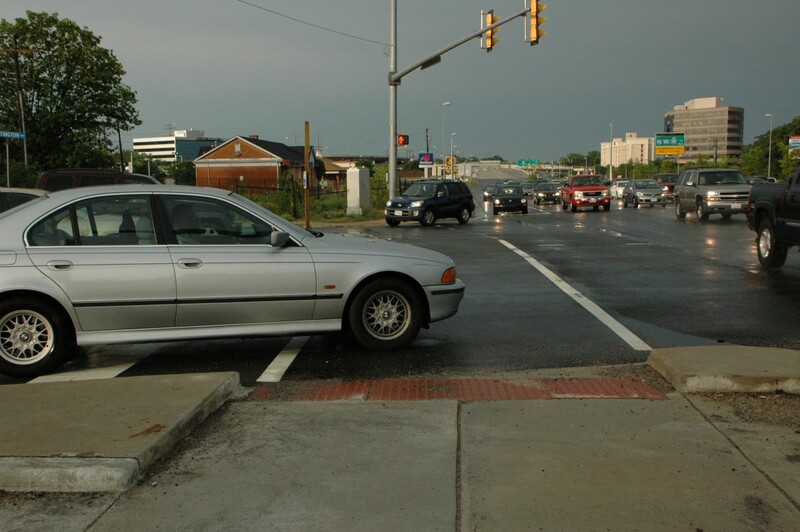 The bridge team has been working, and recently received approval from FHWA and VDOT, on a design exemption to install grates with wider slots (so as to reduce the chances of them clogging). Now they're just waiting for manufacture of the new grates so they can be installed, with the goal of having them installed by the end of July. Yes, lake. Not lane. Lake. But first, an update on another issue. The other issue being the traffic signal at Route 1 and Fort Hunt Rd, just south of the Beltway. The pedestrian signals here have been hiding behind black plastic bags for months. It got to the point where Turbineblade (coincidentally a neighbor of mine who's a bicycle enthusiast) complained on TheWashCycle on Tuesday. So I did a quick walkabout after the storms yesterday evening to check on both the signal and the "lake". Of course, no walk/bike ride would be complete without some driver stopping halfway into the crosswalk. No excuse for this guy...the light on Huntington Ave was red for a full 20 seconds before he got down here. Then there's the dirt/silt piles. Not just the sidewalk here on this side, but the ATL (bike/ped path) on the other side of Route 1 have had these dirt/silt piles ever since the February snowstorms. Nobody has bothered to clear them off yet. More on that later. I did notice two problems with the signals, though. First, and this is the same issue at Huntington Ave, they're not automatic...you have to push the button in order to get the walk signal. While I could see doing this late at night for crossing Route 1, I see no reason why the pedestrian signals can't be automatic during the normal daytime cycles...especially on Route 1 itself. 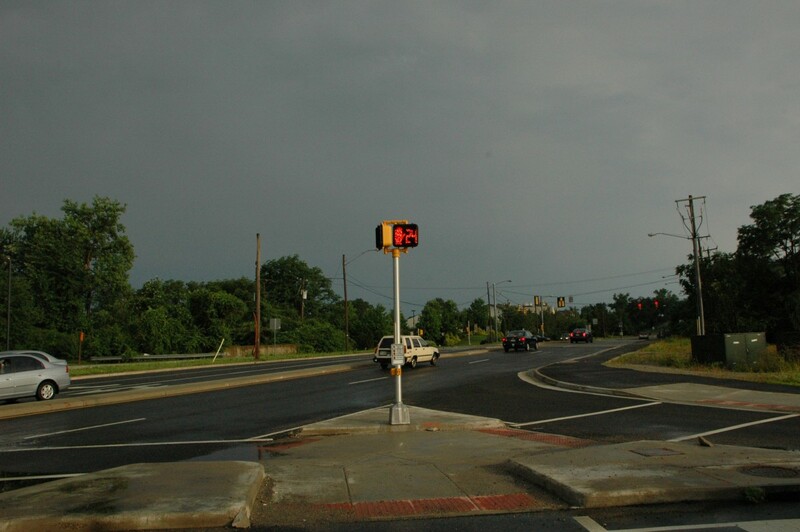 Also, the daytime cycle lengths for cross-traffic crossing Route 1 are long enough to where they could also easily be automatic for the pedestrian signals. The second problem is that the walk phase on the northbound Route 1 side changes to "don't walk" way too quickly, especially since the green phase for northbound Route 1 is quite long. This is one of two drains (the other is hidden under the "lake") that have been clogged with dirt and debris ever since the storm. Because they're clogged, we get this "lake" forming every time it rains. 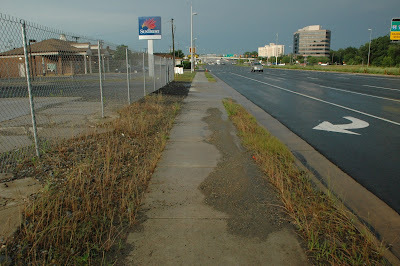 I'm writing regarding the Active Transportation Lane (bike/ped path) along Route 1 in eastern Fairfax County, between Huntington Ave and the bridge over Hunting Creek on the south side of the 95/495 Beltway (constructed as part of the Wilson Bridge project). Ever since the February snowstorms, the path/lane has been covered with piles of dirt and silt leftover from snow clearing operations. This dirt and silt has still not been swept up/removed. 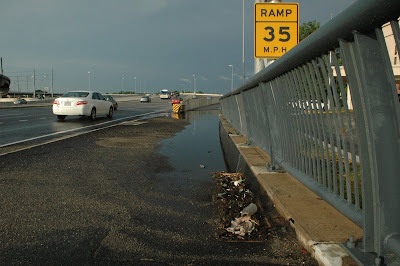 Also, at the south end of the Hunting Creek bridge, there are two deck drains that have been clogged with dirt/silt/debris, which in recent weeks has resulted in this section of the lane flooding over every time it rains, as can be seen in the attached photograph (taken after this evening's thunderstorms). I'm not sure if this is still under the Wilson Bridge contractor or if it's under VDOT maintenance now, but this situation is unsatisfactory and these dirt piles and drains should be cleared out as soon as possible. Thank you for your time. If you have any questions for me, please E-mail me. Before I even got to bed, I had an E-mail from Delegate Surovell, saying "This is ridiculous" and directing his legislative assistant to get an answer from VDOT. Early this morning, I got an E-mail from Bob Driscoll, manager for VDOT's Fairfax Maintenance district, stating he wasn't sure if his maintenance district was responsible for this section, but he'd direct it to the proper maintenance district if it isn't Fairfax. So we'll see. Hopefully, it'll get to the right person, get to them soon, and we'll have cleared out drains and an "empty lake" before too long. Okay, I think I have my settings right for an RSS feed. Here's the URL. If it's not working, someone please let me know. First off, an apology on the lack of posting lately. I was either sick or out-of-town during last month's meetings, and I spent most of my free time in May on roadtrips or working on some of my other projects (one or two of which I may post to the blog here later). Two main highlights out of last night's Alexandria Transportation Commission meeting: Complete Streets, and a brief preview of the BRAC-133 TMP. The draft Complete Streets ordinance is now out on the street. A draft Commission resolution was also created, though I missed the reasoning behind why there's both an ordinance and a resolution. Language in the draft ordinance is borrowed heavily from the National Complete Streets Coalition Policy Elements. City staff are accepting public comments on the draft ordinance until June 23, after which the ordinance will be considered by the Transportation Commission at their July meeting. The goal is to have the proposed ordinance to City Council for consideration in the September/October timeframe. Mayor Euille does not anticipate any issues preventing passage by the City Council, so there's a good chance this will be a "done deal" before the end of the year. The other big item at the meeting was a quick preview of the Transportation Management Plan for BRAC-133/Mark Center. Although the preview was a bit short on plan details, it did include some interesting numbers. For the origin study, the consultant was able to obtain and utilize home zip code data for ALL the federal employees who will be moving their workplaces to Mark Center, a number which comprises some 70% of the total building population...a *VERY* impressive percentage for an origin/destination study. That number was then scaled up to represent the total 6400 employees. The biggest number: over a quarter (28%) of employees are coming from within Fairfax County, with most of those along the 95/395 corridor or along Fairfax County Parkway between Newington and Fair Lakes. 23% are coming from Maryland, with about half of those being within Prince George's County. Arlington and Alexandria house 10% and 7% respectively...numbers that some Commission members think will increase as workers try to move in closer to Mark Center. 6% commute from within D.C. Though much of the transportation focus to Mark Center has been on the 95/395 corridor, and the zip code data preview was hard to read, a rough estimate based on the zip code data is that only about a quarter of workers are commuting along the 95/395 corridor. 1/4 of 6400 is 1600, still a large number, and a number that represents workers already along that corridor and not newcomers after the move to Mark Center. But it's a lot less than some people were expecting. Some interesting mode split numbers as well, based on a survey of workers made last October. Roughly 2 out of 5 drive alone today, a number that is expected to increase given Mark Center's more-car-dependant location. 18% use transit as their primary mode, but 45% utilize transit either sometimes or for part of their commute (yes, there's some overlap within these numbers). However, only 31% are expected to continue using transit in some form after relocation. One of the talking points and an eventual goal of the TMP is to figure out a way to raise that number back up to the existing 45%. Unfortunately, the only mode talked about in any detail during the TMP preview was the proposed shuttle service. Currently, the consultants are studying shuttle service (free for workers, at 10 minute headways during peak hours, and occasional service mid-day, though at least every 30 minutes all day to/from the Pentagon) from 5 locations: West Falls Church, East Falls Church, and Ballston along the Orange Line, from the Pentagon, and from the King Street Metro station in Alexandria. Of course, these preliminary locations are all subject to further study/refinement/consolidation (one problem noted with Ballston and EFC is the apparent lack of locations to facilitate the shuttle pick-up/drop-off/loitering). Also, the city has requested that Van Dorn St and Franconia-Springfield be included in the list for study. The consultant is hesitant with Van Dorn St, given that it only serves the Blue Line and expect limited ridership, but they're more receptive to considering Franconia-Springfield as you have both the Blue Line terminus and a stop on the VRE Fredericksburg line there. They still prefer shuttle service from King St due to the multiple modes converging there...Blue and Yellow Lines for Metro, both VRE lines, and potentially commuters crossing over the Wilson Bridge from Prince George's County. Although we didn't get to see it at the meeting, the draft TMP was given to the city of Alexandria for review last night...I have assurances from city staff that it will be made available/promulgated to the public in some form. The schedule for city/BRAC Advisory Group comments on the draft TMP is to have them to the TMP study team by 20 July to be incorporated into a later draft version of the TMP that is due to NCPC by 30 July. - The Eisenhower Ave Widening project is being considerably rescoped/scaled back in order to redirect funds to other projects within the city. To cut down costs, and also due to the unlikelihood of getting Right-Of-Way proffers from adjacent developers, the rescoping will be to 4 lanes with a narrower median, narrower sidewalks (narrower from the original plan, but still at least as wide as today), and narrower lane widths in order to keep the project within the existing ROW. Even with the rescoping, it's still expected to provide pedestrian and traffic improvements. The redirected money will be used to buy 8 new buses for DASH, construct the bike/ped improvements between Holmes Run and Eisenhower Ave (the planned bike/ped underpass under Eisenhower), and provide $1.3 million for improvements to the Eisenhower Ave Metro station (the city wants to add a station entrance on the north side of the street...very needed IMO). - The Commercial Real Estate Tax (mentioned in a blog post a few months ago) was not approved by City Council for the FY2011 budget. However, the Transporation Commission is still looking into the idea and created a subcommittee to examine how the city might be able to utilize it and build public support for the tax to expand transportation options, with the goal being to have tangible public support and a tangible list of potential projects to present to City Council in time for the FY 2012 budget process. - A last note, relating to parking meters. Unlike what I'd reported in April, the city is significantly increasing parking meter rates...up to $1.75/hr citywide. They're also implementing an "All may park, all must pay" policy, but I'm not sure what that entails except that handicapped parkers will also have to pay.